Combining style and comfort, these Suffolk chairs are a smart and elegant choice for your space. 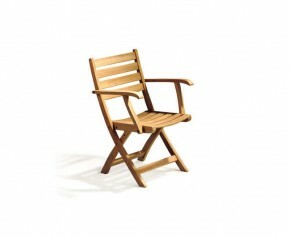 Featuring a high back, cupped seat and slatted back and seat, these teak garden chairs offer the most luxurious comfort. Made from the finest grade-A teak, our Suffolk chairs are guaranteed extreme longevity and are much more durable than their oak and pine counterparts. Able to withstand any weather condition, these teak garden chairs can remain outdoors all year round, assuring minimal fuss and fruitful use. With their classic design, these Suffolk chairs will blend in and compliment all existing furniture and when teamed together can make an attractive focal point. View our range of Suffolk chairs.